Inmates placed on "suicide watch" can stay in solitary confinement for several days. Don Hooper, a lieutenant at the Spokane County Jail, shows off an empty cell for suicidal inmates in an area on the second floor known as "2-West." Inside, the scuffed unit is stripped bare, featuring only a narrow opaque window, a metal toilet and sink, a thick "suicide-resistant" blanket and a thin mattress on the concrete floor. "There's very little there to harm themselves [with]," Hooper tells the Inlander. "We haven't had anybody in a watch cell pass away from suicide." Minutes later, while standing outside the row of 12 cells that are used for "suicide watch" — a practice where inmates deemed at risk are placed in temporary solitary confinement to prevent self-harm — Hooper wanders over to another cell where an inmate has been repeatedly and loudly banging on his cell door, purportedly to find out when he is appearing in court next. After conversing with the detainee, Hooper says that he is "just upset" and that the jail staff on the floor have likely been hearing the banging "all morning" despite informing the inmate of his court proceedings. Meanwhile, county mental health workers check-in on inmates by talking to them through their cell doors as one inmate whistles loudly from a nearby cell before launching into a incomprehensible rant. It's this scene that Lindsay Hayes, a nationally recognized expert on suicide prevention in jails and correctional facilities, says is problematic and needs to be changed in a new report. After a string of inmate deaths in the facility — eight in total have died over the past 14 months, including three who hanged themselves with bedsheets — county officials hired Hayes to evaluate their suicide prevention protocols and practices. The report, which was submitted to John McGrath, director of Spokane County Detention Services, on Oct. 9, featured 27 recommendations, ranging from acquiring suicide-proof mattresses for inmates placed on suicide watch, to increasing suicide prevention training for jail staff and minimizing cell-side interactions between inmates and mental health workers. Looking at inmate suicides in county detention facilities from January 2014 through September 2018, Hayes concludes in the report that Spokane's suicide rate is above average. "The suicide rate was 84.5 deaths per 100,000 inmates — a rate that is higher than that of county jails of varying size throughout the United States," he writes. While Hayes doesn't connect Spokane's frequent inmate suicides to any specific practices identified in his report, some of his findings stand out. For example, inmates placed on suicide watch in the Spokane County Jail are, in practice, held in solitary confinement 24 hours a day with limited access to showers, telephones and on-site visits. Hayes writes that he was informed by jail staff that "inmates placed on suicide precautions rarely are permitted out of their cell" and that "confining a suicidal inmate up to 24 hours a day only enhances isolation and is anti-therapeutic." According to Lt. Hooper, inmates placed on suicide watch typically spend between one to three days in holding cells. As to suicidal inmates limited access to showers and other services, Hooper says it's to keep them (and staff) safe. "If they're trying to harm themselves, we're not going to get them in a shower," he says. "After that time on [suicide] watch, they're going to have access to showers." "Suicide watch is very grueling for everybody," says Jeffry Finer, a Spokane defense attorney who has represented clients who have been placed on suicide precautions. "It may be the way that jails make people safe, but it feels like punishment. "When I have had clients who were at risk and [I told them] 'you're thinking of harming yourself, let someone know,' they responded 'are you nuts? I've had clients tell me that they just stay under the covers with their eyes shut rather than report that they're considering self-harm hoping it will pass." Standing on the floor of 2-West in the county jail where two officers are expected to supervise up to 12 inmates on suicide watch, Lt. Hooper estimates that fully implementing the recommendation regarding the placement of suicidal individuals in holding cells — given the jail's current overcrowding and staff limitations — will require additional staffing and resources to monitor at-risk inmates. "It would definitely take more staff," Hooper says. "The problem is we have 670 people in custody and 60 to 70 percent have significant mental health issues." "I think we had 800 suicide attempts last year," he adds. Other parts of Hayes' report take aim at jail staff practices with inmates before they are placed on suicide precautions. Currently, when inmates are booked into the jail, they are screened by nurses with NaphCare — the private company that Spokane County contracts with to provide medical services in its detention facilities — for mental health issues at an exposed desk in the broader intake room where numerous officers and inmates often linger. Hayes argues that this process severely limits the staff's ability to accurately assess inmates' risk of suicide since they are less likely to disclose sensitive personal information without privacy. "This situation is very problematic," he writes, going on to call for interview booths or rooms to be established in the booking area. John McGrath, the director of Detention Services, tells the Inlander that the county plans to implement all of the recommendations by March 2019 and is currently rewriting its suicide prevention policies to accommodate Hayes' report. Some of them have already been enacted, such as providing follow-up mental assessments to inmates recently discharged from suicide watch. 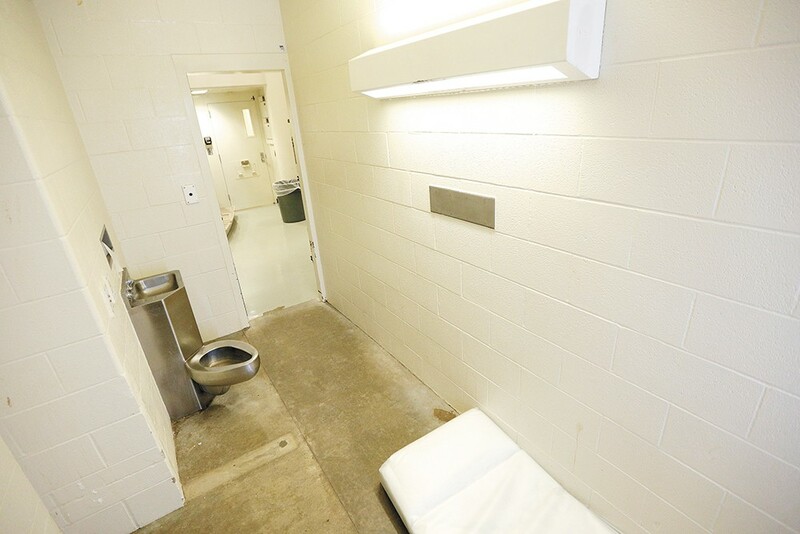 Others, like outfitting the booking room to give inmates more privacy during their mental health screening and acquiring suicide-resistant bunks, are awaiting final cost estimates and will likely require additional funding from the Spokane County Board of Commissioners. "The beds are the most expensive part of this whole project," McGrath says. "They run between $50,000 to $60,000." This post has been updated to correct Lindsay Hayes' estimate of the Spokane County jail inmate death rate. The original print version of this article was headlined "What Now?"